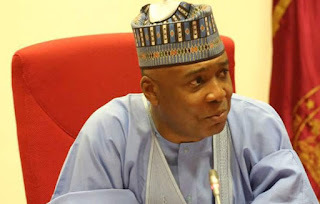 The Director General of Peoples Democratic Party (PDP) Presidential Campaign Council and President of the Senate, Bukola Saraki, has taking a swipe at the APC Trader moni scheme spearheaded by the Vice President, Yemi Osinbajo, the president of the Senate described it as a sophisticated vote buying. He noted that the programme suddenly came up because the nation is heading to election, adding that in 2015, 2016 and 2017, such was never heard in the APC government. “In 2015, I didn’t see the Vice President going anywhere to give anybody Trader Moni. In 2016, I didn’t see the Vice President going anywhere to give anybody Trader Moni. In 2017, I didn’t see the Vice President going anywhere to give anybody Trader Moni. But all of a sudden in 2018. “And the worst part about it is that he goes with the Woman Leader of his party (APC), governors of his party. At least if you are going and it’s Nigerian money, you should have Woman Leader of all the parties because the money belongs to Nigeria. But all I see is APC women leaders. It is wrong, it is morally wrong. “It equates in a way to sophisticated vote buying, because if it is not vote buying, you should have been doing it since 2015. In 2016, you didn’t go. In 2017, you didn’t go. Then all of a sudden in 2018, that is the biggest programme.